The oldest Bulgarian winter resort is Borovets with a history from 1896! Today Borovets is the biggest and most modern resort in Bulgaria. It is situated on the conterminous Borovets col and on the northern slopes of the Mousala ridge in the eastern part of Rila. Huddled in venerable pine woods 1390 meters above the sea level (with highest pistes at 2600 m)makes it a perfect place for relax and recreation. The excellent equipment for ski sports attracts thousands of mountain lovers from Bulgaria and from foreign countries. They can use the 45 kilometers various in difficulty and length ski pistes grouped in three regions: Sitnqkovo – Martinovi Baraki – pistes; Markudjik- 4 pistes and Qstrebec- 3 pistes. The pistes on Qstrebets are the best- and all of the competitions in the resort are taking place there! The resort is a regular host of various winter sports competitions. It has twice hosted World Cup competitions in Alpine skiing. Its biathlon track is one of the best in Europe. Borovets was developed into a modern ski resort of high class with luxury hotels, restaurants, discos, shops and a good choice of pistes and lifts. There are available ski runs for beginners, intermediates and advanced skiers, designed with international markings and multilingual signs. Pistes are bashed and maintained to the high standard. 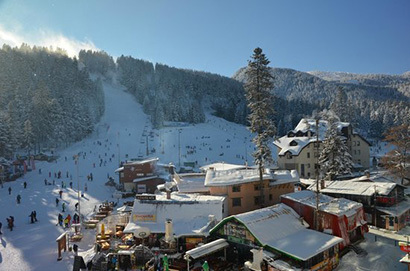 The ski runs of Borovets are located in three different regions. Cross-country and biathlon tracks are located 2 km away from the resort together with the cross-country tuition tracks.Borovets ski centre is serviced by well organized lift system , inclusive Gondola lift.